Team LeBron: Kevin Durant, Anthony Davis, DeMarcus Cousins, Kyrie Irving, Bradley Beal, LaMarcus Aldridge, Kevin Love, Russell Westbrook, Victor Oladipo, Kristaps Porzingis, John Wall. 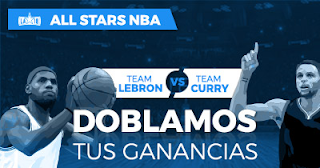 Team Curry: Giannis Antetokounmpo, DeMarr DeRozan, James Harden, Joel Embiid, Jimmy Butler, Draymond Green, Al Horford, Damian Lillard, Kyle Lowry, Klay Thompson, Karl Anthony-Towns. ¿Ya tienes es tu favorito? Entonces, apuesta en PASTÓN.es a cualquier mercado, si aciertas, te doblamos la ganancia neta obtenida en forma de bono de apuestas.